With 2016 almost at an end, it’s time to get back on track and detox from all the holiday goodies. Gyros. I ADORE them. And when I used to live in Los Angeles, my husband and I used to go to this amazing little restaurant that sold the most delicious gyros. It was right around the corner from our apartment, and we used to walk there VERY REGULARLY for dinner. I remember how I used to stand there and literally salivate as I watched them slice that beautifully tender meat off the rotisserie. But now, being a Weight Watcher, I’d have to seriously limit my gyro consumption if I wanted to actually lose any weight. First of all, I subbed out the fatty, high cholesterol lamb meat with tender chicken breast marinated in an amazing blend of Greek spices, lemon juice and yogurt which helps to tenderize the breasts while giving them fantastic flavor. Also, by making my homemade tzatziki sauce, I was able to lower the calories while also bringing in some more incredible tastes. Finally, everything is served on top of a whole wheat pita, and topped with fresh red onion and tomato slices. It is so good. SO GOOD! These healthy chicken gyros make a great Weight Watchers lunch idea. A traditional Greek dish gets a healthy makeover! 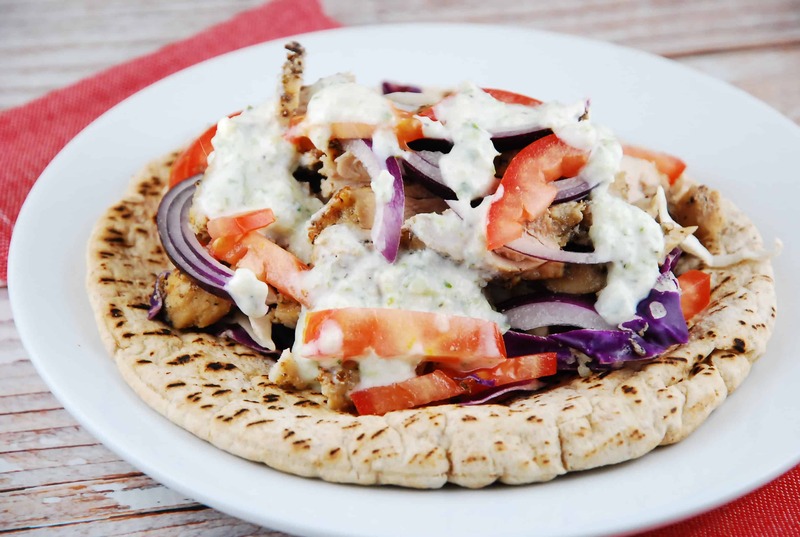 These chicken gyros are topped with homemade tzatziki sauce and are mouthwateringly delicious. In a large bowl, whisk together all the ingredients for the chicken marinade, then add in the chicken breasts, and toss to coat. Cover and refrigerate for at least 2 hours or overnight. Using a food processor, shred the cucumber. Then wrap the processed cucumber in a towel or cheesecloth and squeeze out as much water as possible. In a small bowl mix together the cucumber with the remaining ingredients for the tzatziki sauce. Cover and refrigerate for at least 30 minutes. Heat oven to 400 degrees. Spray a large baking dish with nonfat cooking spray. Place the chicken in the baking dish and cover with foil. Roast in oven for about 30-35 minutes. Remove foil and return to oven, roasting until chicken is fully cooked through and begins to brown. Remove from oven and let rest for 5 minutes. Slice chicken into thin strips and divide evenly on top of each pita. Top each with 2 tbsp tzatziki sauce, onions, and tomato slices. Thanks for the recipe. The print button doesn’t work. It just comes up with the picture and description, but no recipe. Any chance you can fix this? Thanks!